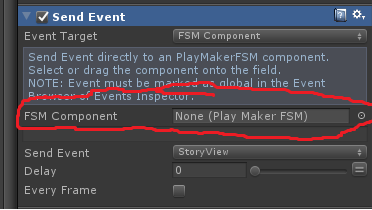 I have a Card game object with an FSM, the FSM sends a global event to a 'Board' game objects FSM. The Card game object is instantiated at run time and as such the FSM Component in 'Send Event' is empty. Is there a way to automate the process of assigninig the FSM component when instantiating the Card prefab?